The mission of the navy during peacetime is not only to deter war, but also to protect national and maritime sovereignty, and perform activities that support national foreign policies and enhance national prestige. Its mission during war is to guarantee the safety of activities at sea by protecting the sea lines of communications (SLOCs), the life line of the country, and exercising control over the sea. At the same time, it must prevent enemy activities at sea, and carry out surprise amphibious operations against the enemy's side and rear areas. The Navy claims to maintain its power at least 30% compared to China or Japan. Due to the nation's geography and proximity to North Korea, the modernization of the Korean Naval Forces is the most important objective of the ROKN. Submarine intrusions have demonstrated the need for faster vessels as well as more sophisticated technology and equipment to deter North Korea from future provocation. On 25 March 2008 President Lee Myung-bak pledged to build up the naval forces to protect Korea`s global commercial interests and expand its contributions to world peace. "The 21st century is the era of the ocean. We have to build a state-of-the-art force that can protect our maritime sovereignty," Lee said in a congratulatory statement during the 62th annual graduation ceremony at the Korea Naval Academy. "With a vision for an advanced deep-sea Navy, our Navy should become a force that can ensure the security of maritime transportation lines, and contribute to peace in the world." In the statement read by Defense Minister Lee Sang-hee, the president stressed the importance of maritime security for the nation`s future. "Sea is the turf for our survival and national prosperity. Only if we efficiently defend and use the sea can peace and economic growth be secured," the statement reads. Korea's Strategic Mobile Fleet could be sent to secure a sea lane in East Asia in the event of a maritime dispute. Currently, the Korean Navy is divided into three sectors -- one each assigned to East, West and South Seas surrounding the southern half of the Korean peninsula. The Strategic Mobile Fleet will take a form of an integrated fleet that can be rapidly deployed into the area of trouble. In this respect, the Stratgic Mobile Fleet is a transition from the current coastal navy to the blue water navy. Both the navy and marine corps were subordinate to the chief of naval operations, who was a member of the Joint Chiefs of Staff. The navy consists of the Navy Headquarters, Operations Command, and Marine Corps Command, and separate commands for aviation, amphibious operations, mine warfare, training, and logistics--all subordinate to the first vice chief of naval operations. It possesses 67,000 troops including the marine corps, 200-some vessels including submarines, and about 60 aircraft. The navy, with nearly 40,000 personnel, is organized into three fleets under the Operations Command: in the East and Yellow Seas and the Korea Strait. Each fleet command possesses combat vessels such as destroyers, escorts, and high-speed boats. Also, the Operations Command possesses vessels and aircraft in order to conduct main component operations including anti-submarine, mine, amphibious, and salvage operations and special warfare. Under Defense Reform 2020, the 15-year military modernization program announced in 2005, the unit structure will shift from the legacy structure of 3 Fleet Commands, 1 Submarine Combat Group, and 1 Naval Aviation Wing to 3 Fleet Commands (FC), 1 Submarine Command (SC), 1 Naval Aviation Command (NAC), and 1 Maneuver Combat Group (MCG). 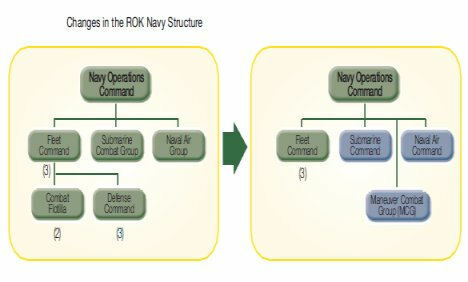 These changes are designed to develop the ROK Navy's maneuver unit structure so as to enhance operational capabilities suitable for future battlefields.